Located in a very high foot and car traffic area in Oxnard, in a strip mall on a major street that runs through this dynamic city, this 2200 sq ft restaurant/bakery facility offers an extremely low rent of only $1.07 per sq ft with no NNN. This facility includes all the equipment you will need to operate a bakery, catering, quick serve, full service and/or buffet. A big screen TV and a karaoke set are neatly set up on a stage in a corner of the spacious dining area. The landlord will grant a 3-year lease and will let you convert it into any concept. Price at $65,000 and with only a month rent needed as deposit, moreover, the owner is willing to carry back up to 30% of the selling price, this offers a very rare chance of an extremely low start up cost to realize your dream of working for yourself. Excellent for couples and partners. This is the owners� first restaurant venture and they admit that this is not for them. Take the next step and complete the online confidentiality agreement and you�ll be provided with the restaurant name and address. Also you will given priority notification to new listings in the future, prior to the general public, giving you the best chance to �scoop in� the best opportunities. 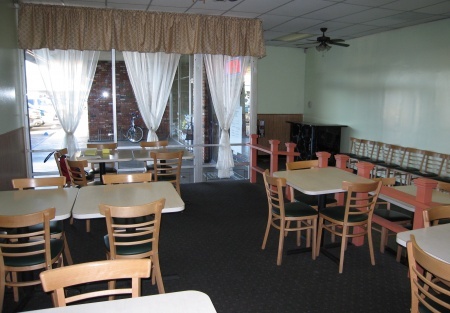 There are also more photos available to our registered buyers.This is a a Paramount Restaurant Brokers, Inc. listing.